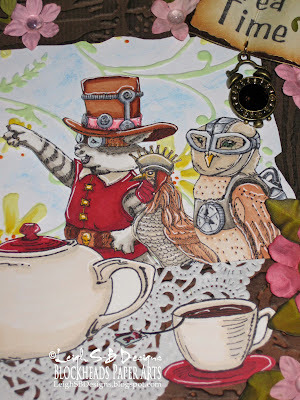 Velvet Paw Creations: "Tea Time Hissy Fit" - when things go horribly wrong at a Wonderland tea party! "Tea Time Hissy Fit" - when things go horribly wrong at a Wonderland tea party! Pull up a chair and help yourself to some tea and cake....UHO, what is all that ruckus about? Oh NO! The Mad Hatter is making fun of the Cheshire Cat's wings...the horror...and...oh my, the Cheshire Cat is throwing a huge hissy fit!!!! Oh dear, the Cheshire Cat just stalked off in a huff...well that was an unfortunate turn of events! 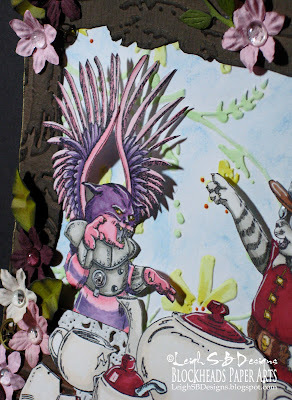 See my Mad Hatter, Cheshire Cat, Royal Rooster and the Rocketeer posts to see how this project began with Blockheads' new Fringe Folktails stamp set and then continue reading! 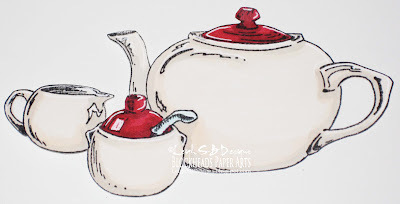 I also used the tea set and text images from Blockheads' Coffee Tea stamp set and stamped them with Tuxedo Black Memento ink onto Neenah Solar White cardstock. E0000, 000, 41, R27, 39, 46 and a white gel pen to add all the highlights. Completely cut out all the images with a pair of sharp detail scissors and put all of the stamped elements to one side for now. Create the 'tree trunk' frame for the diorama and the table from two different shades of brown cardstock and emboss the wood grain design into them with Tim Holtz' Woodgrain Texture Fades embossing folder. Apply Black Soot Distress Ink to all the embossed areas with a foam ink applicator. 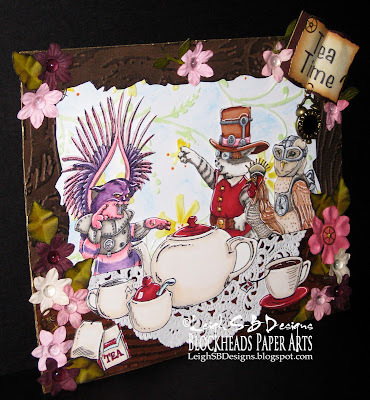 The tea party took place in the Wonderland forest so I embossed a sheet of white cardstock with Cuttlebug's Stylized Flowers embossing folder 3 times to cover the entire piece. Colour the daisies with Copics Y11 and 15, the stems with YG11 and added some details with YR07. For a touch of sky I used a Blue Derwent Pastel pencil and blended it with a Dove Blender pen. Cut a mat from black cardstock the same size as the white embossed panel and adhere them together with Xyron adhesive. Cut a real doily in half for the table cloth and dry lay all the stamped elements to determine their positions and adhere everything in place one by one. Edge the entire diorama with a metallic gold paint pen. A closer look at all those details. 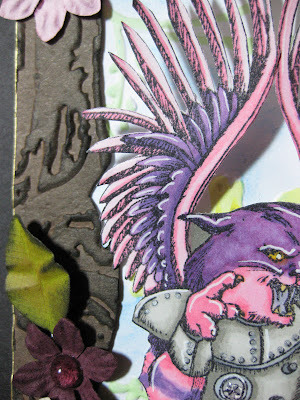 Give the Cheshire Cat's wings and the Mad Hatter's outstretched arm some dimension by curving the cardstock. 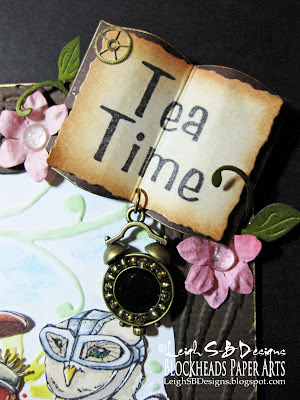 For the fairytale 'Tea Time" book I stamped the text onto a scrap piece of Neenah cardstock and die cut it out with a Spellbinders Deckle edge Rectangle die. Distress the book 'page' with Tea Dye Distress Ink. Die cut out the book 'cover' from a scrap piece of brown cardstock with a Spellbinders Labels 7 die and distress it with a touch of Black Soot Distress Ink. Edge both the cover and the page with a metallic gold paint pen. Fold the die cuts in half, curve the cardstock pieces and adhere them together to form the open fairytale book. Adhere the book to the diorama with dimensional clear KoolTak foam tape. Punch a tiny hole into the bottom edge of the book and attach a jeweled antique gold alarm clock charm to it with a tiny jump ring (Bead Landing Found Objects - Michaels). Decorate the entire diorama with flowers and leaves because we are in a Wonderland forest remember! Die cut out some leaves with Spellbinders Shapeabilities Foliage die from green cardstock and crease and scrunch them to give them dimension. The smaller leaves and little flourishes are clippings from a Cheery Lynn Designs Fanciful Flourish die. Distress the leaves with Tea Dye and Black Soot Distress inks. 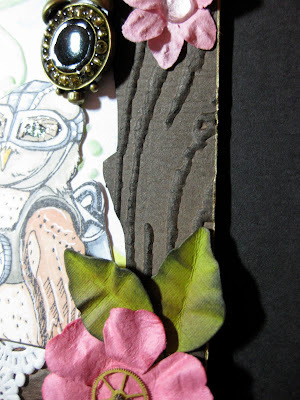 The paper flowers are all by Scrapeabilities and I embellished all the centers with Recollections flat back clear gems. I also added some real vintage watch parts for that extra Steampunk touch. Everything was adhered in place with Judikins Diamond Glaze. Complete the diorama with a small Tim Holtz Alterations easel die cut from black cardstock and adhere it to the back with craft glue. I've entered my diorama into some fun challenges! 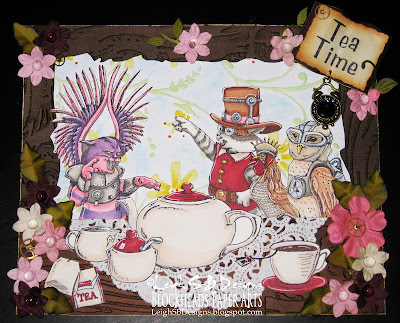 Fabulous teaparty card Leigh..love all the images and colouring and a very entertaining post..fabulous work. Hahahaaa.... you had me at "hissy-fit"!! Love the Alice spin and your work is adorable! Such an adorable and fun card! Love it! i am your newest follower! I just love this card and all the charaters are fantastic! So much fun! Your diorama is darling and I enjoyed reading about it! beautiful details on your party guests! Lovely coloring! Very fun card and story that went along with it! Glad you joined us this week at Simon Says Stamp and Show. I'm sad :( It was like reading a story book and now it's over. This creation is soooo stinkin' cute, I wanted to turn the page to see what happens next! Super job on all the work you've put into this...it really looks fantastic!!! Read your message on the MIM blog and had to giggle. You definitely used tons of paper here. LOL! This is lovely, thank you for joining us at Crafty Sentiments, and good luck. Wow, this is absolutely fabulous, and definitely worth all the work! I love all the elements to this (that little clock charm is gorgeous!) and you've put them together perfectly. 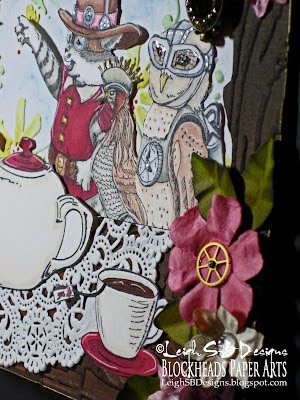 Thanks for joining in with our Charms/Pins theme over at the Craft-Room Challenge. What a great card! LOVE all of you fussy-cutting, layers, and amazing details! Great creation. I love all that detail! Thanks for playing at Mad for Markers this month. Oh wow I enjoyed reading your post, and wow I just love your coloring skills! I really love this, I am a big time AIW freak! I love all your embellies, and the time and thought you have put into this is just outstanding! Wow girl! I am so impressed!! Thanks for joining us at Poisoned Peas Please challenge blog! Wonder-ful project, Leigh!!! Sounds like they were drinking something stronger than tea!! Love how you added the lace tablecloth!! This is beautiful work. So glad you joined us at PPP. Hope to see you again. holy fabulous! thanks for playing with us at PPP! Stunning! All the detail! Awesome coloring & lots of eye candy! The amount of work you put in this shows. Thanks for playing at Poisoned Peas Please. First let me say thank you for joining us at Poisoned Peas Please..second let me compliment your extreme perfection for details. How marvelous.I am a devoted fan of Alice this just spun my mind into creativity.Excellent presentation and disposition. congrats . wonderful.Bravo. OMG That is out of this world awesome, love everything about it, so cool. This is awesome, Leigh! You are rockin' this stamp set! Love all the details and your imagination!